Join us for Grand Opening! After almost 37 years in their current shelter, Mountain Humane is excited to announce the grand opening of their new Animal Adoption and Humane Education Center! The community is invited to a celebration and open house Monday, February 18, 2019 (President’s Day), between 11:00am and 5:00pm. 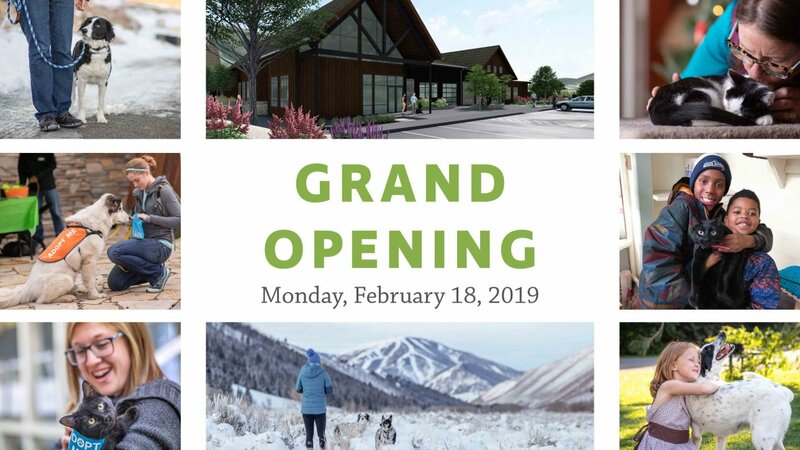 Located at 101 Croy Creek Road, there will be children’s activities, dog training demonstrations, tours of the 30,000 square foot campus, and much more. By more than doubling the number of pets housed and more quickly adopting them to loving homes, Mountain Humane is aiming to increase the number of annual adoptions to almost 1500 by 2021. With approximately 40% of their adoptable pets coming in from overcrowded shelters in Idaho and neighboring states, this will result in more than 1000 healthy, adoptable pets per year being saved from unnecessary euthanasia. As a leader in sheltering practices and nonprofit management, Mountain Humane consistently earns the highest ratings from charity “watchdogs” like Guidestar and Charity Navigator, in addition to recently being honored by Business.org as the top nonprofit to donate to in Idaho. A 2017 study by the Sun Valley Economic Development Corporation revealed an estimated annual contribution from Mountain Humane of more than $5.3 million to Blaine County’s economy. At more than double their operating budget from that year, this means that for every $1 contributed to the nonprofit, $2 comes back to the local economy, in addition to the value and impact of the organization’s services. The entire community are encouraged to come check out this great new addition to the Valley, with activities for all ages throughout the grand opening day. If you are unable to attend grand opening, but would like to arrange a tour, you can call 208-788-4351 x 212.